This month we look at worship issues in the pre-exilic period of Israel’s history, beginning with the conquest of the land. 1) Purity of worship was the central issue in Israel’s conquest of the Promised Land. “Behold, I have allotted to you as an inheritance for your tribes those nations that remain, along with all the nations that I have already cut off, from the Jordan to the Great Sea in the west. The LORD your God will push them back before you and drive them out of your sight. And you shall possess their land, just as the LORD your God promised you. Therefore, be very strong to keep and to do all that is written in the Book of the Law of Moses, turning aside from it neither to the right hand nor to the left, that you may not mix with these nations remaining among you or make mention of the names of their gods or swear by them or serve them or bow down to them, but you shall cling to the LORD your God just as you have done to this day. For the LORD has driven out before you great and strong nations. And as for you, no man has been able to stand before you to this day. One man of you puts to flight a thousand, since it is the LORD your God who fights for you, just as He promised you. Be very careful, therefore, to love the LORD your God. For if you turn back and cling to the remnant of these nations remaining among you and make marriages with them, so that you associate with them and they with you, know for certain that the LORD your God will no longer drive out these nations before you, but they shall be a snare and a trap for you, a whip on your sides and thorns in your eyes, until you perish from off this good ground that the LORD your God has given you. 4) Of course, the people of Israel in their pride often forgot that perspective and looked with disdain upon the Gentile nations. And the dangers of idolatry that they were warned against would be fully realized, as idolatry would often find a foothold in Israel because of the people’s failure to completely clear the land of pagans and the influence of their worship. The people worshiped God faithfully, and God would grant them victory, prosperity and success as a nation. Eventually the people (usually led by their king) would fall into idolatry and false worship (often through religious influences from within or without the land, including through different kings’ foreign wives [e.g., Solomon]). In response God would judge/discipline the nation by bringing them military defeat and/or other hardships. Finally the people would repent and humbly turn back to God, reinstituting pure worship and adherence to the Mosaic Law. In response God would receive their worship, forgive them, and again bring them victory and success. Before too long idolatry would once again creep in, and the cycle would start over as above. It should be noted that God’s judgment on His people was always with the goal of bringing them to repentance and winning them back, so that He could restore their fortunes. 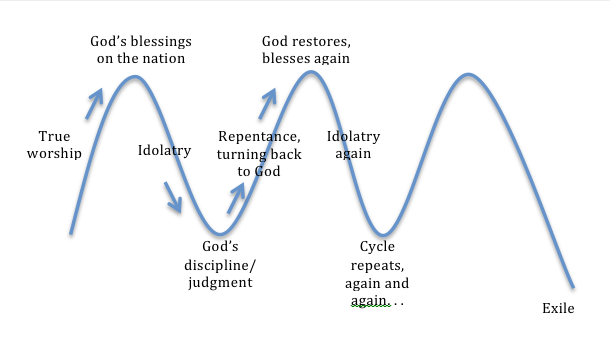 Eventually the idolatry gets so bad that He sends His people into exile (both the Northern, and later the Southern, Kingdoms); but even then God will restore His people from their captivity in Babylon. The nation of Israel was to be a unique worshiping people (Isaiah 43:20-21), who would demonstrate and exemplify true worship before the nations that. As discussed last month, they would be a testimony to God’s greatness both in their obedience (which brought God’s special blessings) and in their disobedience (when the nations could see God’s holy discipline on His own people for the sake of His name). AS WENT ISRAEL’S WORSHIP, SO WENT ITS DESTINY AS A NATION.